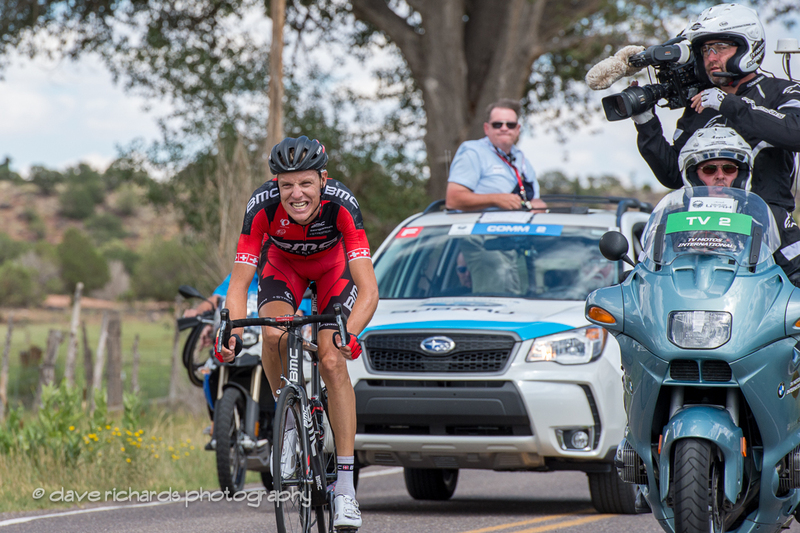 August 5, 2014 – TORREY, Utah – BMC Racing Team’s Michael Schär of Switzerland survived in the original breakaway of Stage 2 presented by iON Camera to win the second stage of the Larry H. Miller Tour of Utah. Covering the 130.7-mile course from Panguitch to Torrey in five hours and three minutes, Schär held off both leg cramps and a furious chase group of 34 riders to win the stage. Jure Kocjan (Slovania) of Team Smartstop presented by CyLance finished second, just two seconds behind Schär. With a time bonus, this vaulted the Slovenian into the Larry H. Miller Dealerships Overall Leader’s yellow jersey. Jelly Belly presented by Maxxis rider Serghei Tvetcov (Russia) finished third on the stage. For a second day in a row, Kocjan finished on the second step of the podium, but secured the G.C. lead and pulled on the Utah Sports Commission Sprint jersey. Park City's Tanner Putt had another strong sprint, finishing seventh and with the main bunch, and jumped into the Best Young Rider jersey and stands just 12 seconds back overall and stands in fifth place. Putt said he plans on doing everything he can to hold onto the jersey for another day before the race turns uphill for the final four brutal stages. Utah's Robbie Squire (Jamis-Hagens Berman) stands 30th overall just 17 seconds back after a strong ride in Stage 2 kept him with the peloton and helped chase down the break. Veteran pro Jeff Louder, UHC, didn't fare quite as well as he finished 13:21 off the pace of the winner. Chris Putt, younger brother team teammate of Tanner, was also off the back having served as a valuable domestique early in the race. Stage 3 presented by the Utah Sports Commission will begin at 10:55 a.m. (MT) on Wednesday, August 6. The Tour of Utah returns to its roots in Utah County where the first edition started 10 years ago. After a start at the headquarters of IM Flash Technologies in Lehi, the course turns south to follow the shores of Utah Lake. This 118.3-mile stage winds into the East Tintic Mountains for the day’s only Ski Utah King of the Mountain climb in Eureka, a mining “ghost town.” The pro peloton will finish with three circuits on the world-famous race track at Miller Motorsports Park in Tooele, which last hosted the Tour of Utah in 2012 for a team time trial. The race is expected to finish between 3:30-4 p.m. It will be a full day at Miller Motorsports Park, with two other cycling events at the complex, the inaugural Tour of Utah Women’s Edition taking place from 1-2:30 p.m. and the Chase Pinkham Memorial Criterium taking place from 5-8:30 p.m.